Defined benefit pension plans are characterized by the fact that payment is based on the period of employment and the employee’s salary at, or just prior to, retirement. The actuarial and investment-related risks associated with defined benefit pension plans are carried by the company. The defined benefit obligations are calculated annually by independent actuaries using the Projected Unit Credit Method. Calculation is based on actuarial assumptions. Actuarial assumptions comprise the company’s best assessment of the variables that determine the final cost for providing the benefits. The obligation is measured at the present value of the anticipated future cash flows using a discount rate (see key assessments and assumptions below). Actuarial gains and losses (remeasurements) are recognized directly in equity under other comprehensive income in the period in which they arise. The recognized cost for the defined benefit plans includes personnel costs, as well as net interest items. Net interest items comprise the discount rate calculated on the average net pension liability for the period, taking fee and remuneration payments into consideration. The difference between the calculated interest income (discount rate) on the plan assets and SCA’s actual return on the plan assets is included in the remeasurement of the defined benefit net liability (net asset) recognized in equity under other comprehensive income. Past service costs are recognized in profit or loss in the period in which they arise. The liability recognized in the balance sheet for defined benefit pension plans is the present value of the obligation on the balance sheet date minus the fair value of the plan assets. Funded plans with net assets, meaning plans with assets exceeding obligations, are recognized as a financial non-current asset provided they are not limited by the “asset ceiling” in IAS 19. Other pension plans, which are not fully funded or unfunded, are recognized as Provisions for pensions. In certain countries, pension payments are subject to taxes or fees. In such cases, these are included in the calculation of the obligation for the defined benefit pension plans. These taxes or fees are recognized as an expense in profit or loss, except in cases where they are attributable to actuarial gains or losses, in which case they are recognized directly in equity under other comprehensive income, as are the actuarial gains or losses. Plans where the employer’s obligation is limited to the premiums the company has undertaken to pay are classified as defined contribution plans. In these plans, it is the employee who bears the investment risk, meaning the risk that the invested assets could be insufficient to generate the anticipated compensation. The Group’s payments relating to defined contribution plans are recognized as an expense during the period the employees carry out the service to which the payment relates. Some Group companies provide post-retirement healthcare benefits. The obligation and anticipated costs for these benefits has been calculated and recognized in a similar manner to that applying to defined benefit pension plans. Severance pay is recognized as a payroll expense when the Group has an obligation to compensate employees whose employment was terminated early. 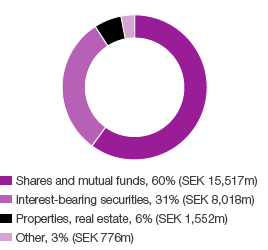 Surpluses in funded plans recognized as financial non-current assets amounted to BS SEK 1,186m (371; 3) on the balance sheet date and provisions for pensions totaled BS SEK 5,602m (2,771; 5,100). Defined benefit obligations include obligations in an amount of SEK 2,461m (1,929; 2,363) pertaining to unfunded plans. SCA has both defined contribution and defined benefit pension plans in a number of subsidiaries. The most significant defined benefit plans are the pension plans in the Netherlands, the UK, Sweden, Germany and the US, as described below. The plan is a defined benefit plan with premiums paid by the company and is managed by an independent fund. Surpluses in the fund remain in the fund assets but can be utilized in the form of premium discounts. The plan is based on average salary and includes beneficiaries’ pension and disability pension. The plan is obligated to meet the minimum legislated funding level. The plan applies a duration matching strategy to control the interest rate risk in the plan. The plan is a defined benefit plan with premiums paid by the company and the employee, and is managed by an independent fund in accordance with British law. Surpluses in the pension fund remain in the fund assets but can be utilized in the form of premium discounts. The plan is based on final salary and includes beneficiaries’ pension and disability pension. The plan was closed to new participants in July 2007. The plan is obligated to meet the minimum funding level according to an agreement with the pension fund. The ITP2 plan (supplementary pensions for salaried employees) encompasses employees born before 1979 and is a defined benefit plan that provides retirement pension based on final salary. The ITP2 plan provides pension as a percentage of various salary intervals. The pension is reduced proportionately if the total period of service is less than 30 years. The ITP2 plan is managed by a fund, and the company may compensate itself using any surpluses in the plan assets. The plan is a defined benefit plan and, in addition to retirement pension, includes beneficiaries’ pension and disability pension. The plan, which is managed by a fund, provides pension as a percentage of a salary interval and is based on final salary. The plan also includes individual pensions based on average salary. No premium payments are required by the company or its employees. The company may compensate itself using any surpluses in the plan assets. The plan includes retirement pension, accident insurance and life insurance. The plan is a defined benefit plan with premiums paid by the company. Benefits are based on a standard amount per service year and are financed through a pension fund. The plan is obligated to meet the minimum legislated funding level. Surpluses in the pension fund can be utilized in the form of premium discounts. SCA has a number of minor pension obligations in some 15 countries. Some of these plans are funded. Remeasurements in the defined benefit obligations comprise changes in financial assumptions, such as changes to the discount rate, etc., any changes in demographic assumptions and experience-based deviations. Experience-based deviations include unexpectedly high or low employee turnover or salary increases. For 2016, acquisitions and disposals relate to the acquisition of Wausau. For 2016, acquisitions and disposals relate to the acquisition of Wausau. 95% (94; 95) of the plan assets on the balance sheet date were traded on active markets in which market quotations are used for the valuation of assets. As in the preceding year, no financial instruments issued by SCA are included in the fair value of plan assets at December 31, 2016. Effect of asset ceiling pertains to funds in two Swedish foundations that can be used for possible future undertakings for early retirement for certain categories of employees. Life expectancy, expressed in years, for an individual currently aged 65. The above sensitivity analysis is calculated by changing one assumption while the others remain constant. SCA has obligations for disability and family pensions for salaried employees in Sweden, secured through insurance with the insurance company Alecta. The company also has employees in Finland who are covered by the country’s statutory TyEL pension plan. These obligations are secured through the insurance company Varma. These benefits are reported as defined contribution plans, since there is no basis for allocating the obligations, plan assets and costs to the individual companies covered by the plan. The budgeted contributions for the company’s defined benefit pension plans for 2017 were calculated at SEK 1,006m. Contributions for multiemployer plans for 2017 were calculated at SEK 51m.